Following problems after launch, GFO is now working properly. See note on the early calibration of IGDR's here, and calibration of GDR's here. TOPEX B and new wind speed algorithm here. ERS-2 has been operating since 1995. (But some onboard recording devices have failed and global coverage of altimeter data is no longer obtained.) Download the latest altimeter calibrations here (256k Word document). JASON(successor to TOPEX) was launched on 7th December 2001. Contact d.cotton @ satoc for the latest calibrations of wave height and wind speed. Launched in March 2002. Initially there were problems with some sensors, but now they all appears to be operating well. Calibrations against buoys and other satellite altimeter data are progressing. 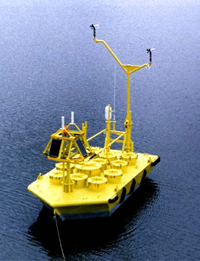 6m wave buoy, typical of those used to calibrate altimeters. Calibration graph showing altimeter wave measurements against buoy values in a variety of locations.